You'll discover exciting new ways to use your electric skillet every day with the Electric Skillet Cookbook. This hardcover 160-page cookbook features over 200 recipes for breakfasts, appetizers, vegetables, seafood, poultry, meats, desserts and more. Beautiful full-color photos will tempt you and reveal just how handy and versatile your electric skillet can be. This hardcover cookbook offers an exciting collection of recipes that have been developed and tested in an 11 Electric Skillet. Most can be made or easily adapted for larger skillets. Whether Spice-Rubbed Tuna with Fruit Salsa or Lemon Chicken Pitas with Garlic Yogurt Sauce, Mexican Breakfast Wraps or Chocolate Fudge Cheesecake, theres a recipe for almost any occasion, taste, or desire. Enjoy quick and easy skillet meals, and discover terrific recipes for entertaining. Tasty appetizers such as Caramelized Onion and Cranberry Crostini, Cheesy Artichoke Dip, and Meatballs with Chili Sauce will be savored with delight! Did you know you can make Almond Cream Cheese Coffee Cake in an electric skillet? You'll be surprised at how well the electric skillet bakes cakes, as well as making fruit desserts, custards, and candies. You will be pleasantly surprised with all the recipes and techniques that you will discover inside! 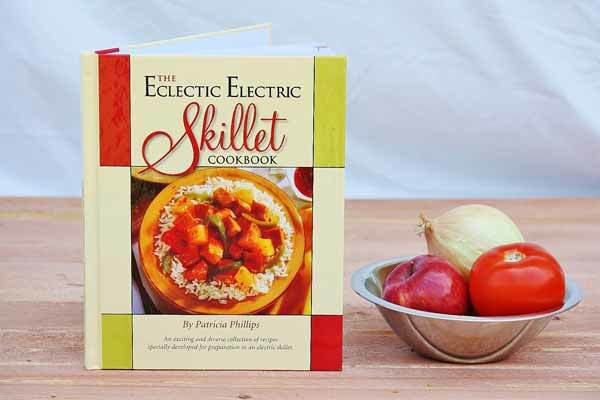 Get cooking with the Presto Eclectic Electric Skillet Cookbook!